Happy Monday my sweet friends! I hope you all had a great Super Bowl weekend! I'm actually writing this about an hour before the game starts, so I obviously have no idea who won as you're reading this. I have to be honest and say that I'm not much of a sports fan, I'm just here for the good "game day" food Eddie's making and the funny commercials ;) He takes control over the Super Bowl menu because he knows I'd make healthier alternatives to the food he'd rather have. He's actually right with that assumption. Anyway, onto more stylish and important things, how to style faux fur coats. It's no surprise that they're one of my favorite outerwear pieces, as I've worn them countless times on the blog and I've talked a lot about how to wear them in those posts. Today, I thought it would be a good idea to share three easy and stylish ways to wear them in ways I've done so myself all in one post, making it easier to reference later on. Being a fashion blogger, I do challenge myself to think outside the box and wear clothing that perhaps I wouldn't otherwise wear and through doing so, I've found that some pieces I'd perhaps turn my head to are actually quite practical, one of which are faux fur coats. Before blogging, I would've most likely thought, though stylish, they wouldn't be at all practical for everyday kind of wear and save them more for special occasions. Honestly, that couldn't be further from the truth. Perhaps some of you feel this way and for that reason alone don't own one, feeling as though you'd never get any real use out if it. These three outfits are ones that I feel can be easily worn on the regular. It all comes down to how you put the pieces together to make it more practical and less forced. I shared this look a little over a year ago in my, Style Lesson:Simplistic, Yet Bold post. Wearing all black is not only chic and flattering, but super easy. It serves as somewhat of a blank canvas for whatever accessory or layering piece you wish to add to bring the outfit to life and make it more interesting, including a faux fur coat. When done in fun colors or patterns, they'll pop even more against the monochrome, and even if you decided to go for an understated version in black or another solid colored neutral, the texture contrast itself adds an equal impact, making for an easy no-fuss option. Another stylish and easy way to wear a faux fur coat is to pair it with leather to create an ultra chic texture contrast, as I've done in my NYFW '16 Day 1 blog post. Once again, you can go for a monochrome look, allowing for the texture mix to break things up a bit. The leather adds some sheen, while the fur adds the texture. You can wear a basic turtleneck or sweater underneath, once again, allowing for the fur coat to do the "talking." This last outfit idea is from my most recent blog post I've shared wearing a faux fur coat, Statement (Faux) Fur. This time of year, many of us love wearing our OTK boots with a pair of skinny jeans and a sweater or turtleneck on top. A great way to add that extra oomph to the fairly basic trio is to top it all of with a faux fur coat. It, once again, adds texture and that stylish element that can otherwise be lacking. 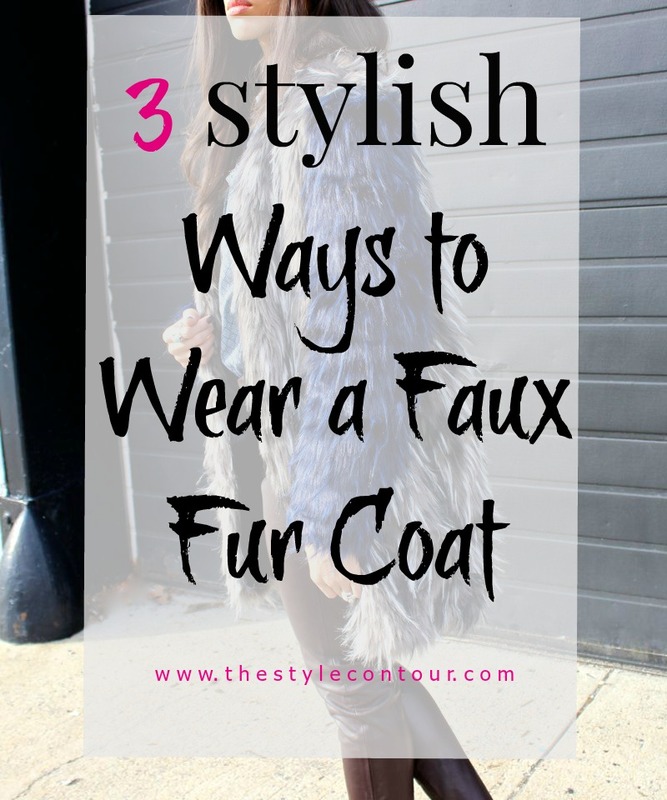 I hope this post has given you that nudge in giving a faux fur coat a try. You don't have to force yourself too much by going for crazy colors and patterns if that's not your thing. As mentioned, the texture alone will enhance whatever outfit you create and it will feel more natural when you're wearing a piece that's most reflective of your personal style. They are statement pieces regardless, so you want to ensure that you feel like yourself and not as though you're playing dress up, it needs to feel natural and only then will it look less forced allowing for you to wear it more casually. On another note, you may have noticed that lately, I've been sharing 4-5 blog posts every other week, with 3 in between. I'm slowly easing back into blogging 5 days a week, as I did before having Aviah. As time allows, I'm trying to publish content daily in hopes of giving you something new and fresh each time you visit. I appreciate your patience and each visit and comment you leave, my sweet friends. Thanks so much for stopping by and I'll see you all in Wednesday's post!